» A Review by Mary Reed: HULBERT FOOTNER – Murder Runs in the Family. A Review by Mary Reed: HULBERT FOOTNER – Murder Runs in the Family. HULBERT FOOTNER – Murder Runs in the Family. Harper & Brothers, US, hardcover, 1934 (shown without jacket). Hardcover reprint: A. L. Burt (shown with jacket). 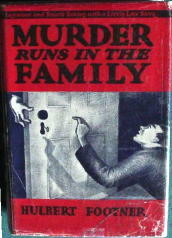 UK hardcover: Collins Crime Club, 1934. The novel opens with a classic situation. Lounsbery, CT, millionaire mill owner and all round rotter James Beardmore is blackmailing his lovely secretary Freda Rollin to force her to agree to marry him when his divorce becomes final. Lance McCrea, who lives at the same boarding house as Freda, has fallen for her and is comforting her after he hears her crying when her “fiance” arrives on the scene. Fisticuffs ensue wherein McCrea soundly thrashes the odious Beardmore. McCrea decides to force Beardmore to tell him what threat he is holding over Freda’s head and then deal with it in some way in order to save her, so he buys a gun for protection and sets out to have a little chat with Beardmore. Unfortunately for McCrea, he winds up locked in Beardsmore’s library with his body, having followed the captain of industry to his large estate outside town. The house had been shut up after Mrs Beardsmore went to Reno to establish residence and get her divorce, so what was Beardsmore doing there at night with a luncheon basket containing two servings of salad, lobster mayonnaise, sandwiches, champagne, and coffee? Could any one of a number of husbands and fathers in town with reason to hate the mill owner be responsible? Is there a connection between his death and that of his equally rotten father, shot and killed by a disgruntled mill employee twenty or so years before? Could one of the other Beardsmores be responsible? After all, they seem quite happy in upholding the family tradition of, well, rottennness. McCrea does not have time to ponder these questions as no sooner has he escaped from the locked library when a posse of police arrive and after an exciting chase through the house and across the estate he is suddenly assaulted by a man lurking in the dark countryside, only to be saved from being shot with his own gun by the arrival of a pursuing policemen, who gets into a fight with the would-be assassin. While this is under way McCrea seizes his chance to run off into the woods, but then hears the sound of a shot…. My verdict: Although the novel starts off as a mystery, it quickly develops into a well written thriller that reminded me more than once of John Buchan’s The 39 Steps inasmuch as most of the narrative is devoted to the protagonist while he’s on the run from the police and other enemies. McCrea proves to be a quick thinking and resourceful young man and ultimately justice is done. It’s an enjoyable read and I think would make a fine period film.